These videos are just a few samples of the faux finishes that can be achieved easily with our patented system. Click PLAYLIST on top right of video title box to view the list of videos. You can also view individual videos by going to the page for a particular faux finish on the main menu to the left. Thank you so much for the pointers Sandra, and I will definitely check out the videos on your website. You are truly an encouragement and a blessing I know to many people. I'll see you here, or there or in the air. Why the Triple S Faux Painting System is patented? Learning how to paint walls with regular paint is easy. However, with so many faux finishing techniques, buying the right tools is important. With our patented ((#7472450) system, you can learn the most popular finishes like Color Washing, Old World, Ragging, Brick and Sponging using the same tools. In addition, adding multiple colors doesn't require additional steps. Our easy to follow DVDs show you how to properly use the tools to create beautiful works of art - on your walls. With other methods, you must wait till the first layer is dry before applying another color. When painting high walls, you have to use scaffolding or you have to carry trays up a ladder, which is dangerous. With our system, you just load the Multi Color Faux Palette and carry it up with the Poofy Pad. 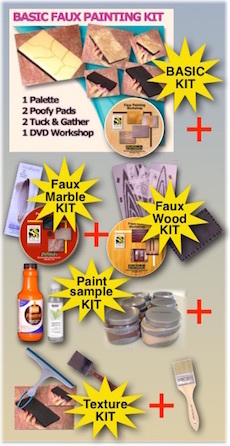 Buy our Basic Faux Painting Kit and get started today. Buy it today for only $39.99 and get a FREE Color Suggestions E-Book (for a limited time only). 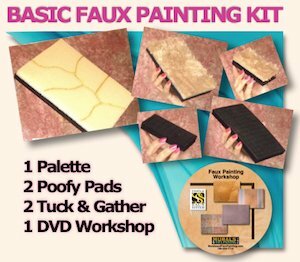 The Multi Color Faux Palette and Poofy Pad are included in the Basic Faux Painting Kit.